Hundreds of scam victims have been identified in South Gloucestershire and are currently being contacted by Trading Standards officers, who are offering them advice and support. The National Trading Standards Scams Team have obtained a copy of the mailing lists used by scammers to repeatedly target their victims with mail scams such as bogus lotteries, fake prize draws, investment opportunities and clairvoyant letters. Once someone falls victim to a scam there is an increased chance that they will be targeted again, and almost 300 addresses have been identified in South Gloucestershire. Officers from the council’s Trading Standards team are currently visiting those addresses to offer advice and support when needed. The team say that they have been surprised by how widespread the problem of mass marketing fraud is within South Gloucestershire as well as by the detrimental impact it has had on some victims. A number of local residents have lost large sums of money as a result of being targeted and caught out by scammers. 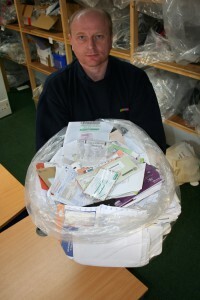 They include one resident who officers believe has lost over £100,000 over a 14 year period to fake prize draw letters. In another case, officers removed an estimated 500 pieces of mail fraud from a vulnerable resident during a follow up visit, after removing a similar amount just a few months earlier. Communities Committee Chair Cllr Claire Young said: “People of all backgrounds can fall victim to postal, telephone, doorstep and email scams, but very often the targets are elderly or people living alone with no family living nearby. All of those visited are also given an information pack which includes South Gloucestershire Trading Standards’ booklet ‘Be in the know…scams and rogue traders’, as well as the ‘Little Book of Scams’ produced by Action Fraud, the national fraud and cybercrime reporting centre. The packs additionally contain leaflets from the Think Jessica charity and information about nuisance telephone call blockers. On some occasions, officers have faced difficulties convincing people that the letters are not genuine after the scammers have told them to be wary of people asking questions who may just want to take their winnings from them. Anyone who is concerned that they, a friend or family member may have fallen victim to a scam can report their concerns to Trading Standards by contacting the Citizens Advice consumer helpline on 03454 04 05 06, between 9am and 5pm, Monday to Friday.